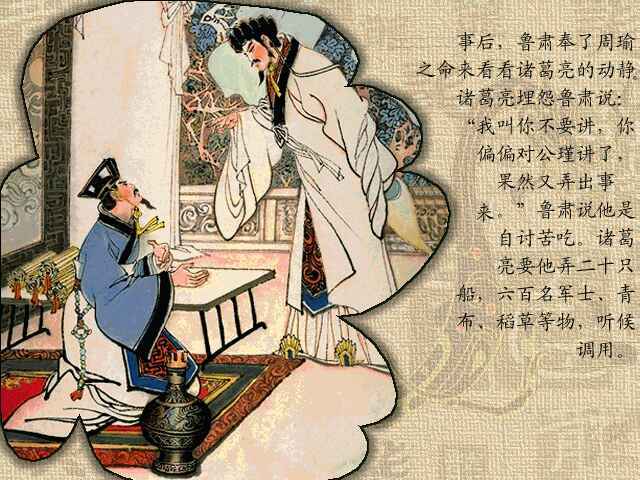 48 The next morning, when Sun Quan heard the story, he asked advice of his counselors. 49 Zhang Zhao said, "They have got away today, but trouble will surely come of it. Therefore, pursue after them without loss of time." 50 So Chen Wu and Pan Zhang, with five hundred of veterans, were sent out with orders to use all speed both by day and by night and bring back the fugitives. 52 Said Cheng Pu, "My lord, your wrath is in vain, for I do not think your generals will catch the runaways." 53 "Will they dare to disobey my order?" said Sun Quan. 54 "Our young lady had always delighted to look upon war and is very fierce and determined. All the officers fear her. Now she has gone with her husband of her own free will; and those sent in pursuit, if once they look upon her countenance, will not dare to lay hands on her." 55 Sun Quan's wrath burned the more fiercely at these words. 56 He drew the sword girded at his side and called up Jiang Qin and Zhou Tai, saying, "You two take this sword and bring back the heads of my sister and Liu Bei. And if you do not, I will put you to death." 57 With this order they set out in pursuit, leading a whole thousand troops. Meanwhile Liu Bei and his wife were pressing forward with all speed. When night fell, they rested for a time by the roadside, but not for long. Just as they reached the confines of Chaisang, they turned and saw a great cloud of dust and the soldiers said that a force was coming in pursuit. 58 "What shall we do if they come up with us?" said Liu Bei excitedly to Zhao Zilong. 59 "My lord, you go on in front and I will prevent pursuit." 60 As they turned the foot of a hill, they saw a troop of soldiers blocking their road in front. 61 Two generals were there and they bellowed, "Liu Bei, dismount and yield yourself captive. We are here by order of General Zhou Yu, and you have kept us waiting long!" 62 Now the thought had come to Zhou Yu that Liu Bei would try to flee, and so he had sent Xu Sheng and Ding Feng, with three thousand troops, to intercept him at this critical spot. They had made a camp there and kept a lookout from the hilltops, for Zhou Yu had calculated that Liu Bei would certainly pass that way. So when Liu Bei and his cavalcade appeared, they all buckled on their arms and barred the way. 63 Greatly fearing, Liu Bei rode back to consult Zhao Zilong, to whom he said, "In front a force barring the road; in rear pursuers. There is no escape. What can we do?" 64 "Do not be alarmed, my lord. The Directing Instructor gave me three plans enclosed in three silken bags. Two have been used and have answered admirably. There is yet the third, and my orders were to open the bag in such a strait as this. This is a day of great danger such as calls me to open the bag." 65 Thereupon Zhao Zilong opened the bag and handed it to Liu Bei. 66 As soon as Liu Bei had seen the contents, he hastened to Lady Sun's carriage and began to weep, saying, "I have something private to say, and I must tell you." 67 "What have you to tell me, my husband? Tell me the whole truth," replied she. 68 "Your brother and Zhou Yu formerly made a plot for you to marry me, not for your sake, but to get me into their power and hold me so that they might recover Jingzhou. They were set on my murder, and you were the bait with which to hook me. Careless of consequences I came, for I knew that the spirit of a heroine dwelt in your bosom and you would pity me. Lately I heard that harm was intended me, and so I made danger to Jingzhou the excuse to escape. Happily for me you have remained true and come with me. But now the Marquis is pursuing us, and Zhou Yu's soldiers are in front. Only you, my wife, can extricate us from this danger; and if you refuse, then slay me where I stand that I may thus show my gratitude for your kindness." 69 Lady Sun grew angry and said, "Then does my brother forget that I am his sister? How will he ever look me in the face? I can extricate us from this danger." 70 Thereupon she bade her people push the carriage to the front. She rolled up the curtains and herself called out, "Xu Sheng, Ding Feng, are you turned traitors then?" 71 The two generals slid out of their saddles, dropped their arms, and stood meekly in front of the carriage. 72 "We are no traitors," said they. "We have the Commander-in-Chief's orders to camp here and await Liu Bei." 73 "Zhou Yu is an interfering scoundrel," cried she. "We of the land of the south have never harmed you, and Liu Bei, the Uncle of the Great Family, is my husband. I have already told my mother and my brother of our journey, and now I find you with an army at the foot of these hills preventing our passage. Is it that you would plunder us of our valuables?" 74 The two generals mumbled dissent. They would not dare such a thing. 75 "We pray you, O Lady, stay your anger. This is no plan of ours. We do but obey our General's orders." 76 "So you fear Zhou Yu and not me!" cried she scornfully. "Think you that if he slays you, I will not slay him?" 77 She broke into a torrent of abuse of Zhou Yu. Then she bade them push her carriage forward. 78 The two leaders thought within themselves, "We are but men of lowly rank. We dare not dispute with Lady Sun." 79 Beside they saw Zhao Zilong was bursting with wrath. So they ordered their troops to stand aside and leave the road clear.